Home › STATION NOTES / BLOG › Heat wave! It has been a sweltering week, with record-breaking temperatures and strong South winds. It was quite unbelievable, to be honest: a swim in Wingfield Basin was in order most days to cool off, as if it were mid-August. And, as is typical in August, there was very little movement and few birds around or in our nets. Indeed, for the week of September 20 – 26, the banding total was the lowest ever – with only 68 birds banded – compared to any other years for the same period. The extreme temperatures brought a kind of cognitive dissonance: it felt like we were in the middle of Summer, yet the birds migrating through are species expected for early Fall: Kinglets (of both species), Yellow-rumped (Myrtle) Warblers, White-throated Sparrows, Northern Flickers, and so on. I am not sure what effect the temperatures had on migratory behaviour in general, but the small numbers of birds seen or captured seem to suggest that there was a reduction in movement during this time period. There were nonetheless some new arrivals: one Orange-crowned Warbler was captured on September 23rd; the first Gray Catbirds encountered this year were in our nets, with one Hatch-Year (young) bird each on September 21st and 24th. That was in stark contrast to previous years, when Catbirds were first observed in August, except in two years when they were later (September 7th in 2009 and September 14th in 2016). We also caught a young male Pileated Woodpecker on September 25th; always an impressive bird to handle (with obvious care: it is so large that two people are required to band it, one making sure to keep a hold on the neck. With a bill that drills holes in trees, human fingers would be no match for it!). 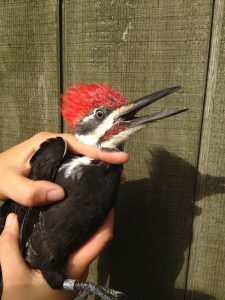 The Pileated Woodpecker, being so large, gets rarely caught in our mist nets: the mesh size we use is too small and makes it easy for them to wrangle themselves free. Nonetheless, they have been banded in eight previous Falls, each season with only one individual (except 2015 when we captured two), from September 19th in 2010 (the only one in September) to October 26th in 2015. The heat wave finally broke up on the morning of the 27th when rain fell briefly at dawn and an increasingly strong West wind blew. It was nice to put sweaters back on but the strong wind prevented many nets from being opened. However, we managed to carry on for the six hours of monitoring with at least five nets. Very few birds were captured. There was a strong, early movement of Common Loons, with loose flocks of up to ten birds together. Loons never migrate in tight formations like geese or other waterfowl but it is not uncommon to see a few flying within sight of each other. It sometimes seems like a raft of birds resting on water decided to take off and fly together but in no orderly fashion. The two adult Bald Eagles were also seen riding the strong wind effortlessly, as perfect Wind Masters! (Thanks to Pete Dunne for such an evocative name. I highly recommend his book bearing this title, even if you’re not a bird of prey fanatic like me: The Wind Masters – https://www.amazon.ca/Wind-Masters-Lives-North-American/dp/0618340726). Pileated Woodpecker showing its chiselled bill! ‹ It is Fall! Is it confusing?! I suppose with the cooling today, the number of insect eating birds heading south off the Bruce will increase? What an amazing bird. And sic a muckle beak on it! Nice work team.